June 17th, 2013 (5:26 PM). Edited June 17th, 2013 by Halfcadence. -Agatha was stresssssful. 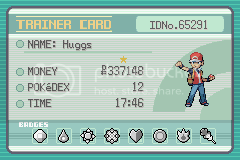 Only Lifebloom died, but Articuno was close the entire time. Got a crit on Fly on the last Gengar, which was awesome. Used one Revive on Lifebloom and one Super Potion on Articuno before Lance. -Muggs went fine! Only Movember died! How the hell did I do that?!? That was the most stressful E4 i’ve ever done! -Flew to Viridian and sold everything! -I feel realllly good about my run. Other than a couple of hidden items I got frustrated trying to find and gave up, I’m pretty sure I got at least like 90% of the items in the game. 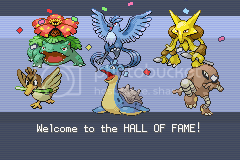 I also beat all, if not damn near all of the trainers there are to beat. And no blackouts!